Pierre Jaquet-Droz was a celebrated Swiss watchmaker and mechanic from the 18th century, known for his elaborate watches and mechanical devices, three of which are of particular interest in the context of this site—the humanoid automata the Writer, the Musician and the Draftsman. Pierre Jaquet-Droz was born on 28 July, 1721, at La Chaux-de-Fonds in the canton of Neuchâtel in Switzerland, into a wealthy family of watchmakers and farmers. 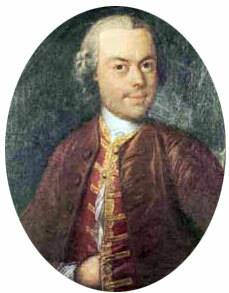 Pierre was educated first to elementary level in his town, then in 1735 he enrolled at the Faculty of Philosophy of the University of Basel, where takes classes in mathematics and physics, given by the famous Daniel Bernoulli, as well as courses in theology, but soon abandoned his religious vocation for training as a watchmaker. In 1738 Pierre Jaquet-Droz set up his first watchmaking workshop at a farm, called Sur Le Pont in his native La Chaux-de-Fonds. His initial works were on pendulum clocks, but at some moment he decided to specialize in automatic mechanisms, in which he would soon excel. Jaquet-Droz was attracted by automaton mechanisms and their technical difficulties and, sensitive to the admiration of some customers, soon specialized in their production. In 1753 he traveled to Paris and after the successful demonstrations, he dealt with the marketing of his pieces and strove to improve their mechanisms. In 1758—1759 Pierre Jaquet-Droz undertook a unprecedented journey to Spain, traveling across southern Europe with his wares with a view to presenting them to the Court of Spain and its King Ferdinand VI. In Spain he demonstrated not only his elaborate watches, but also a few automata. Among them was a clock with a shepherd playing on a flute, and a dog guarding a basket of apples. When the King endeavored to take one of the apples, the dog threw himself on his hand, barking so naturally, that a hound present in the room responded all his strength. In this moment the Courtiers, not doubting that it was an affair of witchcraft, hastily left the room, crossing themselves as they went out. The Minister of Marine was the only one that ventured to stay. Later the Minister asked the shepherd what time is it, but did not receive an answer. Jaquet-Droz remarked that he probably did not understand Spanish and asked the King to address him in French. The question was repeated and the shepherd replied immediately, and the frightened Minister hurried away. Later Jaquet-Droz, fearing that he might be arrested by the Inquisition as a sorcerer, invited the Grand Inquisitor and revealed the inner mechanism of his devices, demonstrating that the mechanism was moved entirely by natural means. Jaquet-Droz's so-called "Shepherd's Clock" is still on display in one of the King of Spain's palace museums. From his trip to Spain Jaquet-Droz returned rich and famous, because the delighted King not only refunded the expenses of the journey, but paid in addition 500 luis d'or. Jaquet-Droz invested the raised money in the developing of his enterprise, establishing a specialized company in the creation of top-of-the-range parts, to the forefront of technological advance. Mainly, they are small parts decorated with automatons, and they soon ensure abundance of cash to Jaquet-Droz and allow him to launch the ambitious project of the automatics androids. From 1767 to 1774, he led the construction of three extremely complex androids: the Writer, the Lady Musician and the Draftsman. These automata were toured throughout Europe and would win their creator even greater acclaim. Pierre Jaquet-Droz was later assisted in the running of his business and the construction of the automata by his son Henri-Louis (1752-1791) and by several other young clock-making mechanics like Jean-Frédéric Leschot (1746-1824), Henri Maillardet and Jacob Frisard. The young Jaquet-Droz, Henri-Louis, was also a very gifted mechanic, who completed his studies in mathematics, physics, drawing, and the music in Nancy, and returned to Switzerland in 1769 to join his father. Pierre put him in charge of his project of automatons, which comprises a "Cave" (disappeared today), and the three android automata—the Writer, the Musician and the Draftsman, which were constructed between 1769 and 1774. There is a story for Henri-Louis, when he was in Paris in 1775, he constructed artificial hands for a man, who had been born with deformed hands, almost totally dysfunctional. The artificial hands allowed the invalid to lead a normal life. Vaucanson saw this mechanical masterpiece and reportedly said to him, "Young man, you start where I would like to finish." In 1783 Jaquet-Droz opened a second workshop in London, later in Geneva, but then he gradually withdrew from the management of his business and received visitors from the whole of Europe who came to admire his work and pay their respects to him. Pierre Jaquet-Droz lived with his son in Geneva for a few years before retiring to Bienne where he died on 28 November 1790, only a year before his son. Despite the originality and craftsmanship of the clocks, watches and small automata created by the company, they had invested too heavily in the China trade on their own account and in partnership with various London merchants and Cox & Beale of Canton. The company was in trouble by the late 80s and in liquidation in both London and Geneva after Pierre Jaquet-Droz's death in 1790 and that of his son Henri-Louis in 1791. What first of all distinguishes these three automatons from those which are manufactured at that time, it is that their mechanism is placed inside their body and not in the piece of furniture on which they sat. It is to say that the genius of the precision goes from pair with the miniaturization of the mechanical wheels, making the synchronization of the movements all the more complicated. The Writer (see the upper image), completed in 1772, was directed primarily by Pierre Jaquet-Droz and is the most complicated of the three mechanisms. The android, made of 6000 pieces, is sitting on a Louis-XV-style stool, holding a quill (goose feather) that dips into the inkwell, and then he shakes it slightly before beginning to draw letters on paper with the pen. There is a special mechanism, allowing his eyes to follow his work. The Writer is able to write a text of 40 characters maximum (it has 40 cams that represents something like read only program), spread over four lines. The main mechanism of the invention is the programming system disk (shown in the lower part of the image), which allows him to write text without external intervention. It is also possible to make him write any words, letter by letter. The Writer might even be interrupted, stopping in the middle of the word, if asked, and wrote another. The Draftsman (see the nearby image) had an appearance very similar to the Writer, but its design is technically simpler than its big brother (made of only 2000 pieces). It was produced mainly by Henri-Louis Jaquet-Droz, and Jean-Frédéric Leschot. Using a pencil, he is able to perform four different designs through three sets of cams home: A portrait of the French King—Louis XV; A drawing of a dog with an inscription; A Cupid in a chariot pulled by a butterfly; And a portrait of the royal couple Marie Antoinette and Louis XVI (the portrait of Louis XV and My doggy are on the same cams). A small bellows concealed in the head of the Draftsman allowed him occasionally to blow the dust off his paper. From time time the Draftsman was able also to raise his hand to examine his work the better and to correct some defect. Apparently the machine can be easily "reprogrammed", changing the cams, because when it was demonstrated in England, it draw the image of the English monarch, not the French King. The Musician (see the lower image) was made of 2500 pieces and was very different from the two other androids. It was a young thin girl, 1 meter 80 tall, sitting outside a small organ flutes. It has a mechanism that activates his ten fingers, it actually plays his instrument. The five different melodies that it is capable of playing seem to have been composed by Henri-Louis Jaquet-Droz, who was not only a skillful mechanic, but also a gifted musician. The mechanism is quite complex, consisting of four parts which actuate the bellows of the instrument, each hand of the musician, and actions such as breathing schedules, the nods, eye movements, or the final reference. The first part of mechanism, completely independent, the harmonium, laid at the base of the musical instrument, acts on two bellows which prove compressed air to the flutes. The three other mechanisms are under the seat. They are connected between them and start one another to form a very complicated group. The girl is stressing her movements when she plays, looks on the left, on the right, and finishes with a curtsy. The astonishing automated mechanisms of Jaquet-Droz fascinated the world's most important people: the royal families of Europe, China, India and Japan. The automata were initially exposed in Chaux-de-Fonds, attracting an important crowd (writers of the day reported that people flocked from all over the country to see such extraordinary works of whimsy and technical skill), but the dedication will come with the road show: Geneva (1774), Paris (1775), then Brussels, London, Moscow, and Madrid, where the automatons will be sold to a collector in 1787. 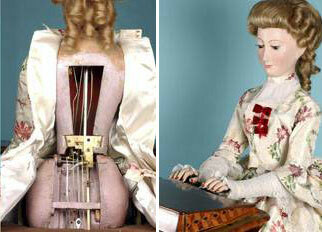 From Spain, the automata will return to Paris around 1812, to be admired at the Paris Exposition of 1825. In 1830 Martin and Bourquin bought the machines and walked them in whole Europe until 1904, using them as the principal attraction of their Museum of the Illusions. The History and Archeology society of Neuchâtel, helped by a grant from the Swiss federal government, eventually bought the three automata in 1906, for 75000 francs in gold, and gave them to the Museum of Art and History of Neuchâtel, where they have been ever since, in virtually the same condition as when they were first made, some 230 years ago.